DEAR GOD! Is the man being paid HUGE sums of money or is he just plain dumb? I believe this is the first time I’ve seen his eye with a pupil,his teeth too. Zealous, this comic is basically fantasy version of the Darwin Awards. People actually TEST 9-volt batteries like that? Like, just to see if they work? I only do it because the jolt makes my tongue go pleasurably numb. Pizza is _so_ much better. It tastes like pain and death! I laughed so hard at Rogue Psyker’s comment, oh god! oh noes! now he has to start over with growing eyebrows and a moustache again! 0__0 hehe i’m glad i’ve never been shocked that badly. I find this hilarious, it’s the best one coming from the beginning. I think he’s being paid quite large sums of money to BE stupid…why else could he afford to make all that he does (see later comics)? That sounds very painful. Like the time I stuck a paper clip in between the prongs on a car battery. My hand would twitch randomly for a week, and I still can’t write straight. GASP! HE ACTUALLY HAS EYES?! Ah, but fire tastes like bacon!!! Ansem Retort. And you are worng, fire merely tastes of AGONY. I have been electrocuted four times by virtue of being stupid enough to touch the metal part of the plug on a lamp while it was halfway in the outlet. Half of the times I did it on purpose cause it made me feel all tingly. I once tried to get a lightbulb to light up by touching it to the exposed ends of a cut plug. I was having trouble because one of the ends was still wrapped in the plastic, so I decided to chew the plastic off. I completely forgot to unplug the thing from the extension cord I was using to get the electricity to the lightbulb. Maybe that’s what’s wrong with me? Car battery? dunno, but 12V seems a little too weak to actually do anything to your hand… It can however burn the paperclip, lead-acid batteries have crazy current output if shorted. Then again, i do know this guy who says he gets jolted from a car battery… Maybe too much salt in the body. Ouch! Can’t believe he did that! When I was younger, I liked the taste of metal. One day I put one end of a cell phone charger in my mouth, not realizing that my dad had forgot to unplug it. okay, lemme try it now. oOOOoooOOhhh, that feels funnnnny! It’s kinda sourish, like a lemon, but it’s all tingly, like licking a 9-volt. I gots horses. I play with the 300-acre electric fence generator that we stuck on our 10 acre pasture all the time. I melted my tongue to it once and shorted it out. Thankfully I was rather close to the box. My tongue is still kinda forked. Wounds opening and cauderizing instaneously does not taste good. WAIT!?????? Biff’s a cartoon???? Not an incredibly rubber, immortal, and insane man whose biography is written in The Book of Biff. TomCC: it’s not the voltage that kills you, it’s the amperage. Wow, I’ve done that. Trying to rework the wiring of the TV and peripherals and didn’t have an extra hand for a 5v adapter. I saw blue for a while. i plan on never doing that having touch mains voltages pretty much everyday for the last few years i’d much rather keep it away from my mouth. Our dog once bit an electrical wire. It took a piece out of his tongue, poor puppy. Strangely enough, we have a dog who chews on wires. But she has never been damaged by them… even when they were plugged in. eyebrows gone, teeth and eyes showing, who wants to give Biff CPR? 1. A 12v auto battery will put out enough current (amperage) to weld with, but only for a short time. It is also enough amperage to seriously injure you. 2. The reason 110vac 60Hz is so dangerous is that contact both freezes your muscles and causes the heart to go into fibrillation. 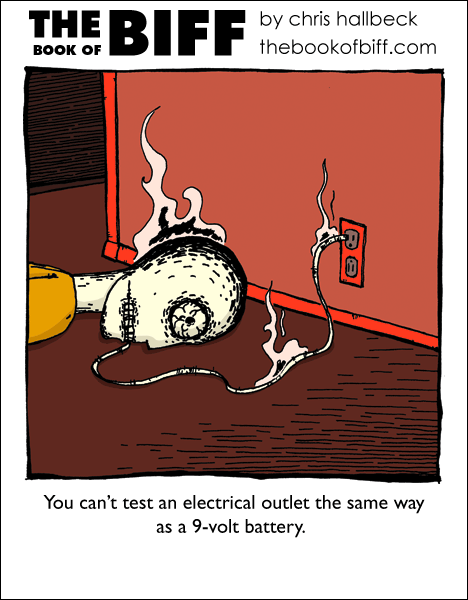 In the military, we were told that it is the deadliest voltage. 3. During my military career, we had one individual who regularly tested for 28vdc control voltage with his tongue. The theory was that he had been shocked so many times that he could barely feel the 28vdc. If he checks his mains electrics daily by eating them, that would explain Biff’s lack of hair and the vast, crackling eyebrows. H my god biff actually has eyes!!!! Ah, I see. Biff IS blind – or at least, is now.